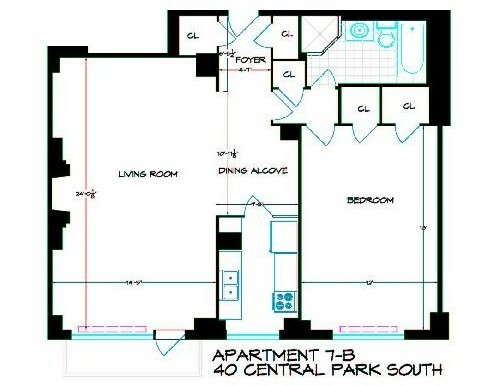 Furnished One Bedroom Looking onto Central Park from Every Room! Over-sized one bedroom apartment with extra-long living and working fireplace in the center. The huge wall of windows on one end looks directly onto Central Park. The windowed kitchen is facing Central Park and has plenty of counter space. The bedroom is also extremely large, with a walk-in closet (one of four closets in the apartment) and more park views. There is more than enough room for a King bed with the accompanying furniture. There is a large en-suite bathroom that has a soaking tub and separate glass stall shower.